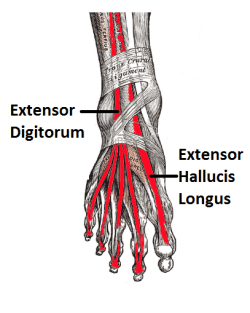 Rupture of the Extensor Hallucis Longus (EHL) results in the inability to dorsiflex (move up) the great toe. This allow the opposing muscle to act without resistance and the great toe remains in downward position. The EHL tendon is prepared with suture to re-approximate the tendon ends (below left), and the tendons ends are tied together with the suture which will allow the tendon the heal with scarring (below right). Another case of a primarily repair EHL tendon after rupture. membrane, deep fascia and intermuscular septa. Divides into 4 tendons after passing under the extensor retinaculum. There is no dorsal insertion of the EDL to the proximal phalanx. Instead, the proximal phalanx is suspended by the EDL and extensor sling. Extensor sling (saggital bands) span either side of the tendon and are anchored to the volar plate of the MTP joint. Tendon then divides into 3 slips. Central slip inserts into base of middle phalanx. Two lateral slips unite and insert onto distal phalanx. Extends toes at the foot. Dorsiflexion and everts foot at the ankle. Main action of the EDL is to dorsiflex the phalanx. It is able to dorsiflex the PIP joint only when the phalanx is in a neutral or flexed position.